The Angry Birds are back to save birdkind from mischievous pigs in Angry Birds Space, and they took over Seattle’s famous landmark to show that they are ready for action. The iconic red bird was blown up 35 feet and seen ready to be launched to space, hanging from the Space Needle as its slingshot. Fans and non-fans alike trooped to the base of the Space Needle to witness the installation sponsored by T-Mobile. The mobile network seems keen in supporting Angry Birds, as it can be remembered that T-Mobile also mounted a live Angry Birds event last year in Barcelona. The display was in line with the release of Angry Birds Space, the latest version of the phenomenal game from Rovio Entertainment which was released Thursday for various platforms. 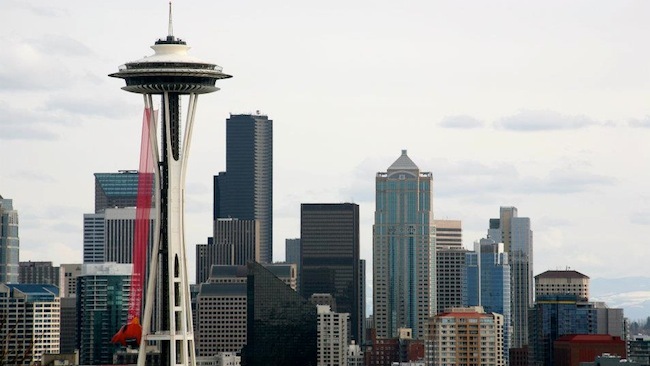 It is just apt that Rovio and T-Mobile chose the Space Needle as the newest bird slingshot: standing at 605 feet and considered to be the tallest structure west of Mississipi River, its 300-foot long slingshot will surely not miss the green pigs.